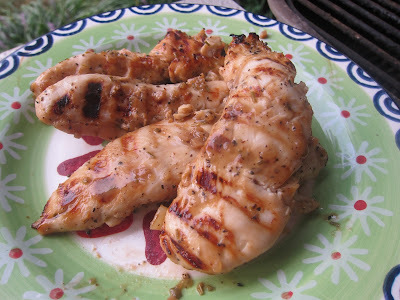 I must confess my go-to barbecue marinade is Worcestershire and Kraft Italian dressing, because I haven't been able to find really good BBQ marinades. They are loads of rubs and sauces but not many marinades. 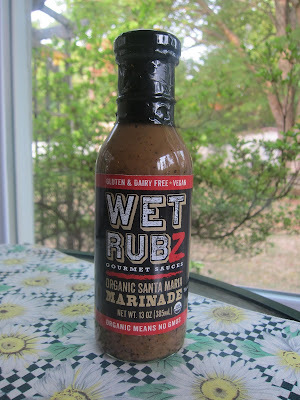 When Wet Rubz got in touch, I was thinking of rubs, but this is actually a marinade. It's heavier than a North Carolina vinegar, so it would go on later for larger cuts of meat but is fine right from the start on grilled hamburgers and grilled chicken strips or tenders. My favorite way (so far) to enjoy Wet Rubz is on chicken. If your chicken is kind of bland, it sure will not be with this marinade. In fact, it's too hot for my mild son when it's small pieces. He might be okay with full sized chicken parts, but I've only done the quicker ones so far. As for me, I like heat and love this marinade. It's got a kick but I'd say zippy mild to medium. I like to give a range and would say you'd want to go easy on this one with a general crowd but pour it on for heat lovers. I also found out that this marinade is all natural. Now, that's a good thing. Chef Andy Martin and wife, Aimee, from California, wanted to build a barbecue marinade from natural ingredients, so that is what you have here. You can taste it too. I really love natural over processed. I've moved this up to my favorite of the marinades I've tried out to date. It really is THAT yummy. I do add the warning about the heat though. If you are a mild guy/girl, then you would want much more meat to marinade. *I did receive a bottle of the marinade to try for free. That has no impact on my review. I've been known to say a barbecue sauce tasted like ketchup (so sorry), so I do call it the way I see (though tastes can surely differ). Great lead on the product, Cyndi! I have just about stopped trying new bbq marinades as most of them have been pretty lame. Glad to hear there is one worth using. That's very interesting. I hadn't heard of a web rub. We use mostly dry spice rubs for our BBQ. Thanks for the info! That's very interesting. I had never heard of a wet rub. We use all dry spice rubs for our meat. Thanks for the info!